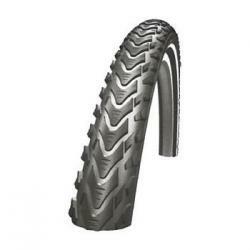 This is a dual application trekking tyre that is suitable for road or trail use. It has easy rolling on road and great control on rough trails but is very durable and has a Kevlar Mountain Bike puncture protective belt. It's also offers safer year round cycling, thanks to the strong tread design, grippy compound and 3M Scotchlite reflective line.